If you live with an egg allergy, you know that egg lurks in many places, some obvious and some quite obscure. For example, you might find egg-based ingredients in marshmallows and in cappuccino mixes. Therefore, if you're allergic to eggs, you need to be able to read an ingredient label for likely egg ingredients. In addition, you need to know some of the most common and surprising foods that contain egg. This is for your own protection, since egg appears in some places you won't necessarily suspect, and you might have a bad reaction if you don't identify it before eating it. Egg allergy is the second most common food allergy behind milk. While most kids will outgrow egg allergy by the time they are 5 years old, or by the teen years, some people will have a lifetime of egg allergy. Navigating the world with a food allergy means protecting yourself from harm. In other words, you need to know how to read an ingredient label and what to stay away from when labels aren’t available so you avoid an allergic reaction. Here is a list of the words you need to know to avoid egg in your food. Obviously, anything with the word “egg” contains egg ingredients. Words like albumin and the prefix ovo- or ova- indicate egg is present. Surimi. Artificial crab meat which may contain egg white. Mayonnaise. Typically made with egg yolk. Meringue, meringue powder. Made with or from beaten egg whites. Baked goods. Egg is used as a binder, emulsifier, and/or aerating agent in many baked goods. Watch out for cakes, cookies, pies, casseroles and other baked items. Egg substitutes. Often used to cut the cholesterol down in whole eggs, egg substitutes are made with egg whites. Macaroni. May be made with egg; check the ingredient label. Typically, fresh pasta is made with egg and dry pasta is made without egg. Egg noodles. Made with eggs. Marzipan. May contain egg whites, especially if the marzipan is home-made. Marshmallows. May be made with egg whites. Watch out for marshmallow crème and fluff. Nougat. May contain egg, as egg whites are whipped together with sugar and nuts and/or fruit. Pasta. Dry pasta typically does not contain egg but may be cross-contaminated with egg-based pasta in a factory or manufacturing facility; cooked pasta in canned soups and other ready-to-eat dishes may contain egg. Salad dressing. Some salad dressings like Caesar are typically made with egg. Other creamy dressings may be made with mayonnaise. Protein Shakes. Traditionally made with protein powders, some people are getting away from protein powders and are using egg white powder or whole egg in their recipe. Baked pretzels, chicken pot pie, bagels or other baked products. Often an egg wash is used to produce a shiny appearance on the finished product. Specialty coffee drinks. Egg whites may be used as a foamy topping on coffee drinks like cappuccino. Baking mixes (just add water types). May contain dried egg ingredients. Custard. This is a dessert made from whole eggs. French Toast. A breakfast item made by dipping bread into an egg mixture and cooking it on the stove or baking it in the oven. Ice cream. A few types of ice cream may contain egg, such as French Vanilla, fudge brownie batter, key lime, cake batter, salted caramel or red velvet cake ice creams. Your best bet is to inquire at the ice cream shop or read the ingredient label. Soufflés. Made with egg yolks and lightly beaten egg whites. Some vaccines contain egg protein, like the measles, mumps and rubella (MMR) vaccine. According to the American Academy of Pediatrics, it is safe to give this vaccine to egg allergic individuals. The flu vaccine contains small amounts of egg. According to the American Academy of Allergy, Asthma & Immunology (AAAAI): "Studies show that flu vaccines can be safely administered to egg allergic individuals, wither in the primary care provider's office or allergist's office depending on the severity of the allergic reaction to eating eggs." The Food Allergy Labeling and Consumer Protection Act (FALCPA) requires the word “egg” on a package if any trace form of egg is present. Check every time, as ingredients and manufacturers production practices may change. 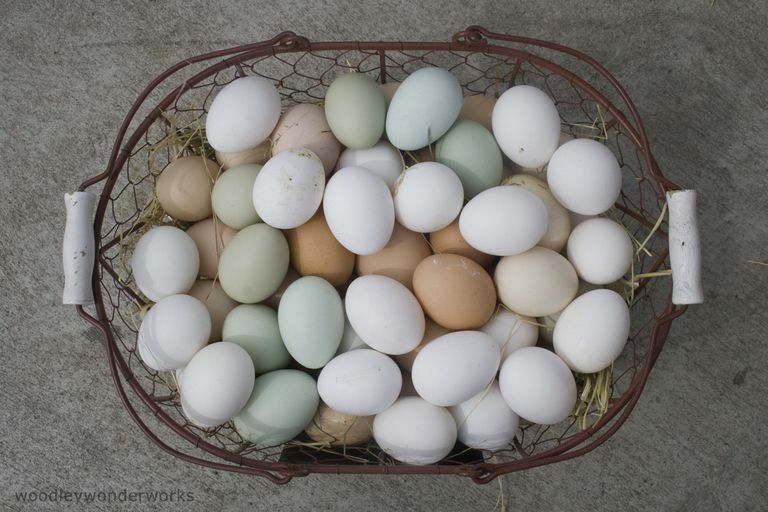 Egg allergic individuals should also avoid eggs from duck, turkey, goose, and quail, as these are known to be cross-reactive with chicken egg. In addition, it is nearly impossible to completely separate the egg yolk from an egg white, so if you know you are allergic to one component of egg but not the other, you're better off avoiding the whole egg. Cross contact is difficult to avoid in the case of egg. Likewise, be careful at salad bars, Asian and other all-you-can-eat buffets, ice cream parlors, and other food environments where utensils can be switched between items, potentially contaminating egg-free dishes. American Academy of Allergy, Asthma & Immunology: Egg Allergy and the Flu Vaccine.